There are no symptoms or signs that can conclusively be shown to be due to chronic cholecystitis. Symptoms attributed to this condition are vague with abdominal discomfort or distension. There is no doubt that gallbladders studied histologically can show signs of chronic inflammation and occasionally a small, shrunken gallbladder is found either radiologically or on ultrasound examination. However these findings can be seen in asymptomatic people and therefore this clinical diagnosis should not be made. 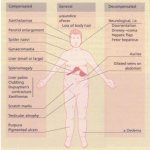 Most patients with chronic right hypochondrial pain suffer from functional bowel disease. Common bile duct stones These may be asymptomatic or they may present with anyone or all of the triad of abdominal pain, jaundice and fever. The pain is usually severe and situated in the epigastrium and right hypochondrium. The pain may be accompanied by vomiting. The pain usually lasts for a few hours and then clears up, only to return days, weeks or even months later. Between attacks the patient is well. The jaundice is variable in degree, depending on the amount of obstruction. The urine is dark and the stools are pale. High fevers and rigors indicate cholangitis. The liver is moderately enlarged if the obstruction lasts for more than a few hours. Prolonged biliary obstruction or repeated attacks lead to secondary biliary cirrhosis, but this is now rare. BLOOD COUNT. A leucocytosis is present. BLOOD CULTURES. These may grow an intestinal organism (E. coli, Strep. faecalis). BIOCHEMISTRY. A cholestatic picture with a raised conjugated bilirubin and alkaline phosphatase in the serum and relatively normal serum aminotransferases. PROTHROMBIN TIME. This may become elevated over a few weeks owing to poor vitamin K absorption. ULTRASOUND EXAMINATION. This reveals a dilated common bile duct sometimes with a visible stone. Stones in the common bile duct can be missed and endoscopic ultrasound is a more accurate method of detecting a stone. Stones in the gallbladder suggest, but do not prove, that gallstones are the cause of the dilatation. X-RAY. A plain abdominal X-ray may reveal gallstones. ERCP. This is performed to confirm the diagnosis and to remove the stones. 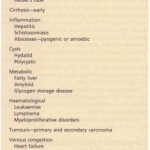 The differential diagnosis includes all causes of jaundice. The acute episode is usually allowed to settle and the serum bilirubin usually falls to normal levels. During this stage the patient normally only requires pain relief but occasionally antibiotics are necessary. The serum AP falls more slowly than the serum bilirubin, and if the patient is seen some time after an acute attack elevation of this enzyme may be the only evidence of biliary tract disease. Further management of common duct stones is discussed below. 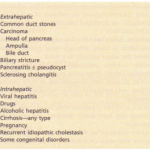 Acute cholangitis is due to bacterial infection of the bile ducts and is always secondary to bile duct abnormalities. Th.e common causes are common duct stones, biliary strictures, neoplasms, or following ERCP in the presence of large duct obstruction. The symptoms are fever, often with a rigor, upper abdominal pain and jaundice. All three symptoms are present in 70% of cases. Older patients can present with collapse and Gram-negative septicaemia. Specific signs may be minimal but tenderness over the liver occurs. When all three symptoms are present the diagnosis is not difficult, but the patient can present with only a fever and an accompanying leucocytosis. Blood cultures are often positive (usually for E. coli) and a severe Gramnegative septicaemia can occur. Treatment is with intravenous amoxycillin 1 g 6-hourly WIth intravenous gentamicin 2-5 mg kg-l daily in divided doses for severe cases. Ceftazidime is also used. Suppurative cholangitis can occur as a complication. The fever continues and shock develops despite adequate antibiotics. Urgent decompression of the duct should be performed, usually endoscopically with placement of a nasobiliary drain. The subsequent treatment of the obstruction is either endoscopic or surgical. This is the treatment of choice for virtually all patients with gallbladder stones and symptoms. L~PAROSC~PIC CHOLECYSTECTOMY is now the operation of chOIce. The abdominal cavity is insufflated with carbon dioxide under a general anaesthetic and the laparoscope and operating channels are inserted through the umbilicus and three other small incisions. The gallbladder is dissected from its bed on the liver and removed whole after the cystic duct and vessels have been clipped and haemostasis achieved with electrocautery or laser. The mortality is less than 0.1% and the patients can leave hospital in 24-48 hours. Complications are low and include wound sepsis, bile duct injury and retained gallstones in the commen bile duct , patient can return to full activity in approximatelyb 7 days , compared to 3 weeks for the open operation. OPEN CHOLECYSTECTOMY. This is also a safe procedure with a mortality occur in obese and elderly patients. Only patient who refuse surgery should be considered for alternative terapy . POST CHOLECYSTECTOMY SYNDROME. Some patient continue to complain of right hypochondrial pain, flatulence, indigestion and intolerance to fatty foods after cholecystectomy, despite a normal radiological appearance of the biliary tree. In the vast majority of these patients the original diagnosis was incorrect and the patient was suffering from functional bowel disease, the gallstones being an incidental finding. The occurrence of severe pain with jaundice suggests a retained stone in the common duct. Gallstone dissolution or disruption Cholesterol gallstones can be dissolved by the bile acids chenodeoxycholic acid and ursodeoxycholic acid, which increase cholesterol solubility in bile. They only dissolve radiolucent stones in a functioning gallbladder and not calcified stones. Only about 10% of patients are suitable for this therapy. Gallstone dissolution takes anything from 6 months to 2 years and when the treatment is stopped 50% of the gallstones recur. Chenodeoxycholate also produces diarrhoea. Shock-wave treatment of gallstones can be carried out using ultrasound-guided lithotripters that do not require a general anaesthetic or water bath. Laparoscopic cholecystectomy has made the above techniques redundant except in a very few cases where an anaesthetic is contraindicated. Stones in the common bile duct Endoscopic sphincterotomy with removal of the common bile duct stone, if possible, is performed initially. The sphincter of Oddi is cut with a diathermy wire. Stones can then pass from the common bile duct following this sphincterotomy either naturally through the enlarged opening or they can be removed endoscopically using a Dormia basket. The duct is ‘swept’ with a balloon to ensure that all stones have been removed; a cholangiogram is performed. Large stones (>15 ern in diameter) that cannot be removed whole, can be crushed with a mechanical lithotripter or fragmented later by extracorporeal shock-wave lithotripsy. Alternatively a double pig-tail endoprosthesis can be inserted to allow biliary drainage. In a patient with an intact gallbladder containing stones, the endoscopic removal of a stone is usually followed by a laparoscopic cholecystectomy. Whether this is necessary in all cases is debatable as further problems are only encountered in 20% of patients. Some surgeons can remove common bile duct stones at the time of laparoscopic cholecystectomy, but mostprefer the stones to be removed endoscopically. If an open operation is performed, the duct should always be explored. 4 Further surgery if the above fail. GALLSTONE ILEUS AND BILIARY ENTERIC FISTULA. Gallstones can occasionally erode through the wall of the gallbladder into the intestine. They can cause obstruction, mainly in the terminal ileum but occasionally in the duodenum. CARCINOMA OF THE GALLBLADDER may be causally related.